One of the goals of our just-finished Digital Literacies Workshop for high school students was to create a final online portfolio of some of the work and learning they did during our five weeks together. For various reasons (which I will write about later), we ended up in Wikispaces as our home for portfolios. 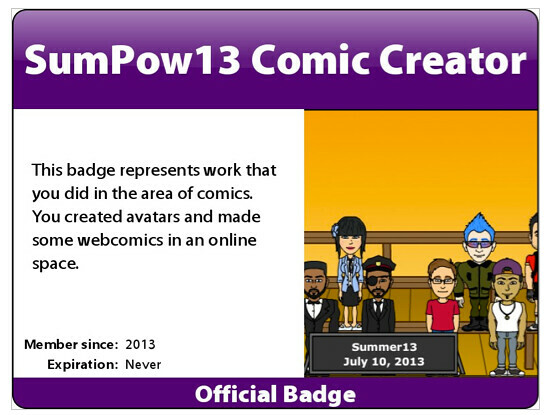 Seeking a better way to share out their portfolios, I created this ThingLink image with their avatars from Bitstrips. Just click on a student and it will take you to their portfolio, where they have done some writing, published a video game, a comic and more. The five week Digital Literacies workshop that I was co-facilitating for high school ELL students came to an end last week, with families invited into the sessions and a big celebration even (complete with one group performing Julius Caesar on stage). I created this video to share with families and the students who were in our workshop session all summer. This week, the heart of a Twitter Chat discussion with the Making Learning Connected MOOC folks centered on the use of badges in education. I am still mixed and I freely admit that I feel a bit confused on the topic. On one hand, I see the value of validating and recognizing student expertise and growth. 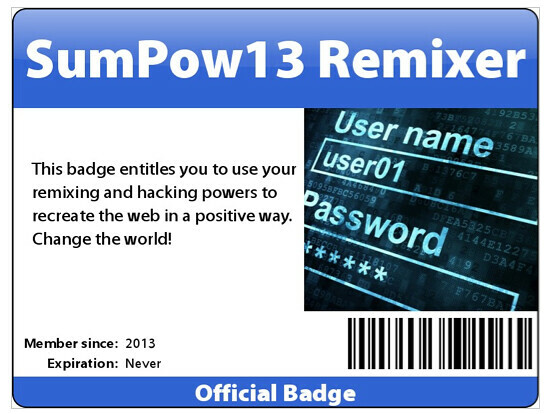 On the other hand, it seems like the awarding of badges could be arbitrary or just meaningless bling. I liked how Paul Oh talked about the possibility of badges being part of portable learning documents that follow the student, though, and Karen Fasimpaur noted that employers might find it useful to see the kinds of learning that potential employees might have done. So, I keep going back and forth. Karen noted that her view of badges began to change when she worked with Paul Allison and others in the Youth Voices camp this summer, where high school students made their own badges for their community. That’s what I want to know more about — how to create the environment where that kind of inquiry work is nurtured and where badges are just one part of the learning equation. 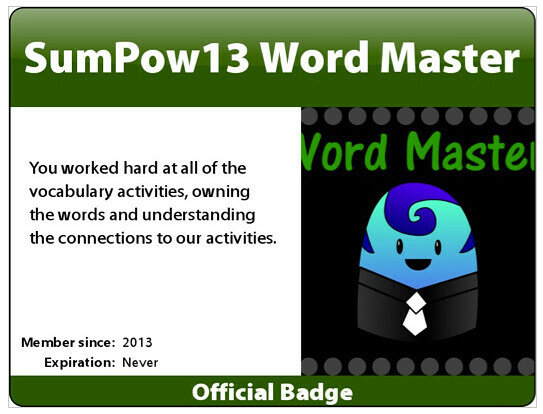 Since I have never used badges before, I decided to start small, creating a few for our ELL Digital Literacies Workshop. 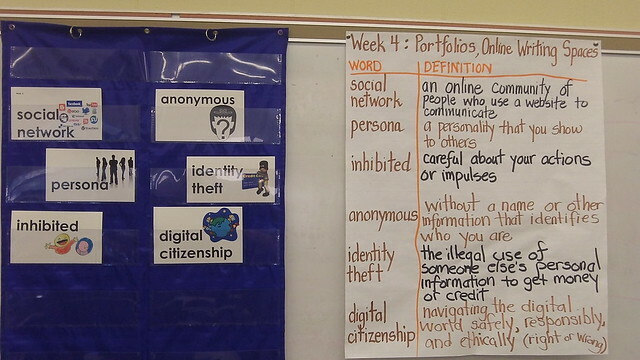 Our students are now beginning to create digital portfolios of their learning this summer (we are using Wikispaces), and while there is some criteria for what must be included, we also have made a list of suggested optional content. These four badges are in the “optional” category, but they align to the inquiry work we have been doing the past four weeks around digital literacies. 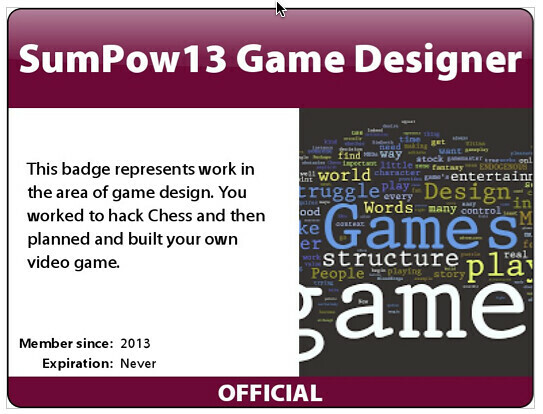 I’ll need to talk more about why they would award themselves a particular badge. Maybe that will be one of our “writing into the day” prompts. That will be an ideal time to ask them, what badges are missing? What else can we make together? There’s always some resistance to this stage of game design. Kids just want to jump in. But I insist on the storyboarding element, and liken it to the rough draft stage of writing. Sure, the game might move in other directions when it is finally underway, but the storyboard is a road map of ideas. 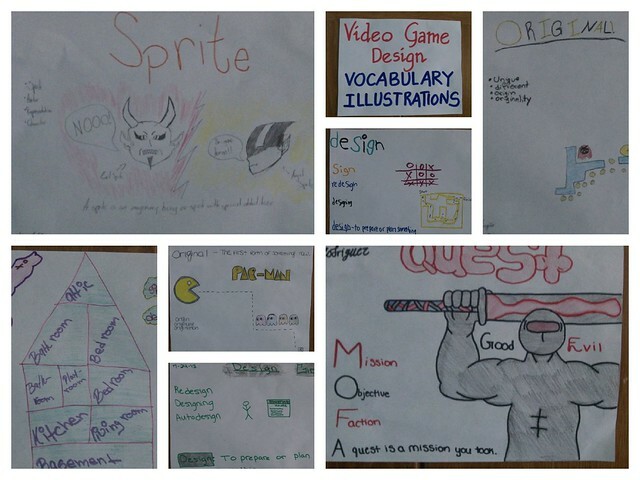 In the end, even those who fought me on this activity were grateful that they were able to articulate some ideas, and the storyboard itself becomes a place to have more focused discussions with students about their games. 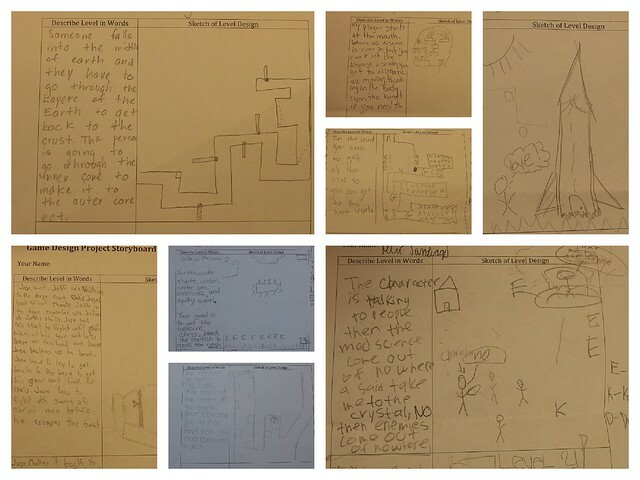 In addition, for ELL students, the storyboard is a non-threatening way to write, as it combines art and short narrative text, and symbolic thought. 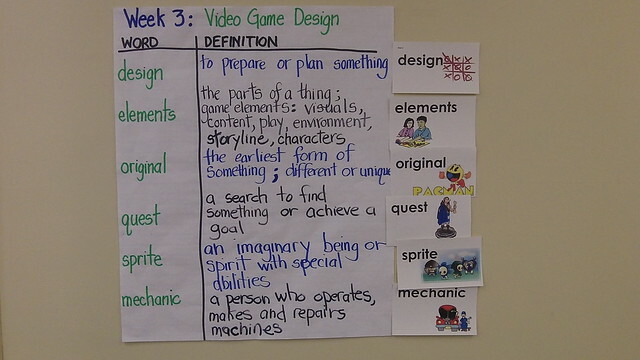 The students in this summer are all struggling writers, but I suspect we have gotten more writing out of them in their daily journals and in projects like the video game storyboarding than their regular teachers do. I can’t say that for sure. It’s anecdotal. But it seems like even the most struggling writers have been deeply involved in what we have been doing. PS — if you have interest in video game design, you can check out the resource site that we created at my school, and feel free to use any of the resources there. 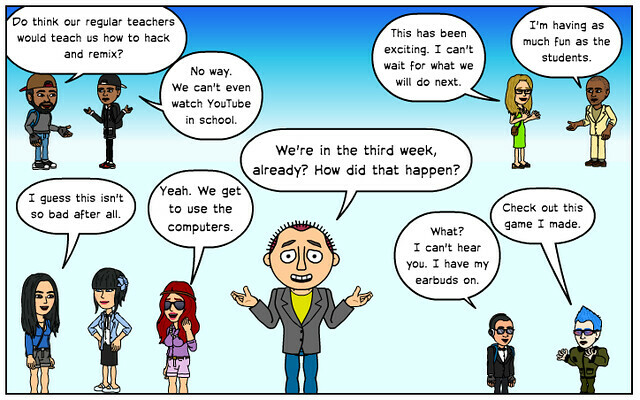 I made this the other day for the high school students in our digital literacies workshop. They got a kick out of it. I am very fortunate. I have an incredible teaching partner in our Digital Literacies workshop for English Language Leaners high school students this summer. 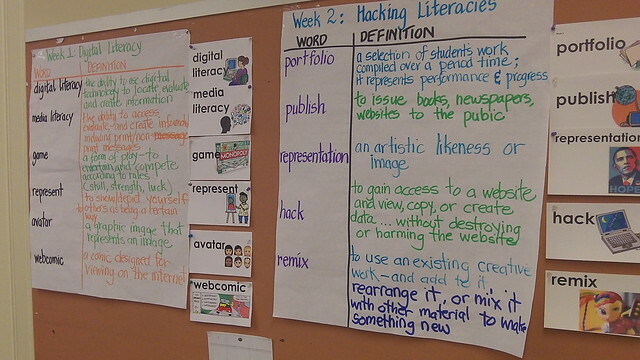 While I have been mostly focused on the digital part of our program (leading activities around hacking, remixing, digital identities and video game design), my colleague – Maria Cahillane — has been focused on the core academic skills, including vocabulary activities. The result has been a nice balance of academic support (which one of the key goals of the summer program, which we are just one part of) and playful exploration of digital ideas. Maria and I work well together as a team, and while she is relatively new to the technology front and tells me she is learning all the time from our workshop, I am thankful, too, because her activities and use of vocabulary and writing with ELL students has given me a bunch of ideas for my students, too. I love reciprocal learning, particularly when it comes to teaching colleagues. 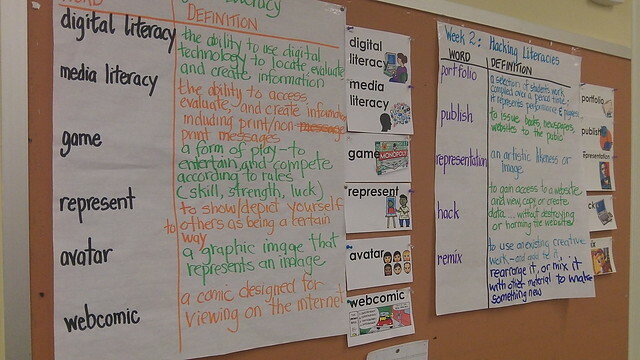 I’ve mentioned that I am teaching a digital literacies workshop for high school students (English Language Learners) this summer and we are now moving deep into our video game design unit. Their task is to design, build and publish a science-based video game on Gamestar Mechanic, and their game has to be a few levels deep and tell a story. It’s a lot to ask of these students, but they’ve risen to the challenge all summer, and I suspect the games will be amazing. I am a big advocate of planning out a game first. So, last week, they were brainstorming on paper some of the ideas around story, challenge, and theme to the games they will be building. Next up is storyboarding, which is a way that I explicitly tie in the game design process with the writing process — making visible the connections on how people work to create things, from brainstorming to drafting to sharing to revising to publishing. To help them think about storyboarding out their games, which they will begin on Monday, I have been one step ahead of them, working on my own game. Not only does this send a message to the group that “I am with you” on this journey, but it also provides my colleague and I with an opportunity to share out the process of game design, making the steps more visible. So, during a brainstorm session, I came up with the idea of using the Solar System as my science theme, and the story is that the player/character has unexpectedly found themselves off of Earth and they need to get back home (this is the Quest of the game). 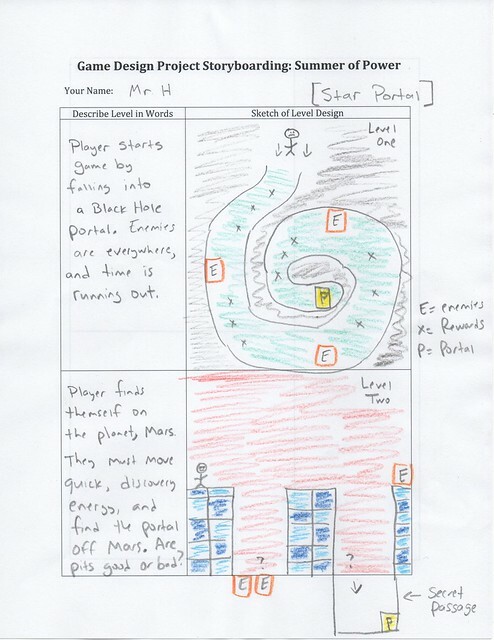 Different levels will represent different planets, and the player/character has to find the “portal” that will bring them to the next level, and eventually, back to Earth to win the game. Here are the storyboard pages from the first levels of my game. At this point, I have only created the start of the first level. 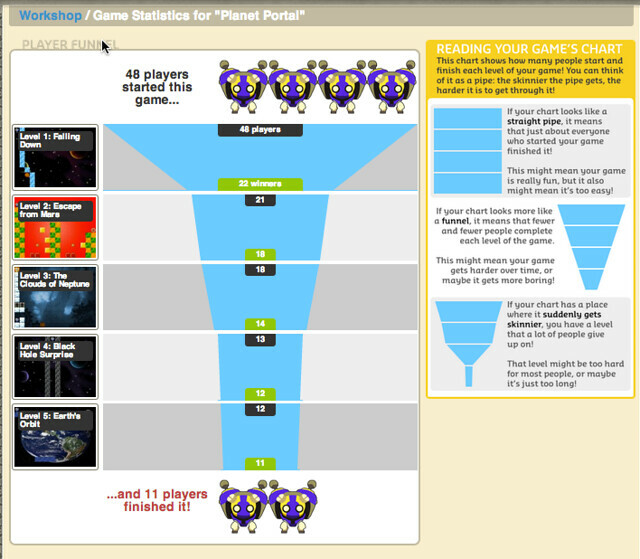 There is a tool in Gamestar Mechanic that allows you to create a screenshot of levels (a tool that I love to use, and encourage all of my students to use). 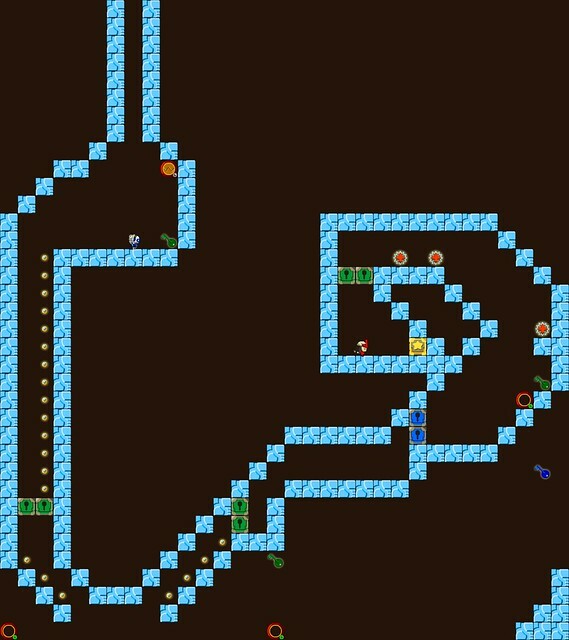 Here is an overview, then, of the first level of my game.